You are welcome to contact me by phone at Mill Run: 571.252.2160. You may send a written note in your child’s red daily folder. Or, you may send an e-mail message: susan.hayden@lcps.org. I will reply to your message as quickly as possible. The students will use their red folder as a daily take-home folder. Please check the folder every day as soon as possible after school and return the folder the next morning. I will check the red folder every morning for notes from home. In addition, the children will take home yellow PTO folders on Thursdays. The yellow folders will contain finished work and important notices regarding school events. Please be sure to empty the yellow folder, sign the front of it, and return it to school the next day. The 1st grade team posts our nine-week unit plans on the Mill Run website: http://www.loudoun.k12.va.us/millrun. These plans are correlated with the Virginia Standards of Learning. You can also find detailed information about the first grade curriculum on the county website: http://www.loudoun.k12.va.us/Page/1. I will do more than I have to. I will treat others as I want to be treated. And I will try to become a better person. We work very hard to establish a positivie classroom community right from the start of the year. At the beginning of the year, we will discuss the Mill Run code as a class and what it looks like for us in first grade. We will identify specific behaviors (taking turns, listening to the speaker, etc.) that demonstrate the school code in our classroom. 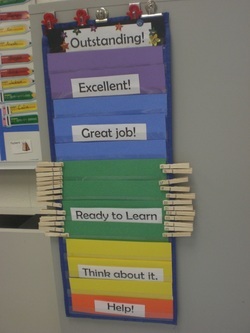 Once we have these guidelines established, we will use our rainbow chart to track student behavior. Every child begins each day on green, “Ready to Learn.” When a child is setting a super example of following the school code, I will invite that child to move her clip up one color. If a child is forgetting to follow the code, I will ask him or her to move the clip down one color. On the rare occasion that a child goes to orange, I will be contacting you by phone to discuss ways we can work together to help your child remember to follow the code. Losing “Fun Friday” time is one option we will consider. You will find a monthly calendar in your child’s red daily take home folder that we will use to keep you informed regarding your child’s behavior each day. The children will simply color the square of the day to match the location of their clip. Please keep the calendar in the folder, so it will be ready for your child the next day. Please also remember that being on green is super. I expect most children will be on green most days. In addition, I coordinate this rainbow chart with a marble jar. Students who are on green or above for an entire week will be able to add three marbles to the jar. A student who gets up to black will add five marbles to the jar. I also might pass out marbles at various times throughout the day. This is one way to lavish praise upon individual students who are working hard to set a positive example. When the marble jar is full, the entire class will be able to choose a prize from the treasure box. We are a team. First grade students will begin homework in October, and more information will be sent home at that time. For now, your child’s homework is to take home their folder and show you their behavior chart, schoolwork, and any notes from me each day. We also encourage first graders to read at least 15 minutes every night. 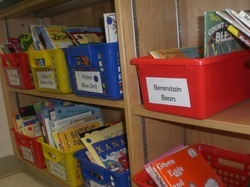 Please use the reading log sent home in the Thursday folders to record the books that you read together. This will help your child in reading and building fluency. Also, the librarians use these logs to give the children points toward the Reading Incentive Auction at the end of the year. Students can use their earned points to earn a special prize from the library. Loudoun County has an established homework policy. The general rule is that primary children (Kindergarten through grade 3) should be required to spend no more than 30 minutes daily doing homework, in addition to the nightly required reading. Children in grades 4 and 5 should spend no more than one hour. If homework varies too widely from established times, parents should talk to the teachers. Teachers and parents should encourage good study habits and instill responsibility. Also, Mr. Browning, our art teacher, is looking for egg cartons. We give special recognition to each child on their birthday. The class will sing "Happy Birthday," and the birthday child may have additional opportunities for sharing and helping throughout the day. There is no obligation to send in treats on your child's birthday. If, however, you would like to send in a treat, you have many options. Pencils, stickers, or bookmarks are festive. You may want to donate a book in your child’s honor to our classroom or school library. However, Loudoun County policy does not allow food or drinks of any kind as a birthday treat. If your child would like to distribute party invitations at school, please make sure the entire class is invited. If your child will invite only a small number of students, please use the class list to deliver these invitations outside of school. Thank you for your help with this! Here is a summary of our weekly special classes. Students should wear shoes for P.E. on Monday, Wednesday, and Friday. We will go outside for recess every day, weather permitting. If you would like a copy of our draft weekly schedule, please click here. Please keep in mind, however, that these times are approximate and adjustments on a day-to-day basis are inevitable. We will take a brief snack break each morning. The first grade team has decided to request that the morning snack follow a common menu for our grade. We will visit other first grade rooms on occasion, and there are several children in first grade with severe allergies. Please help your child select a healthy snack to bring to school that is cheese, raw fruit, or raw vegetables. The snack should be a finger food and require no utensils. This limited menu only applies to snack in the classroom. Thank you for your help! If your child will be buying lunch from the cafeteria we strongly encourage you to put money on a lunch account (please see the cafeteria staff if you have questions regarding this). This can be done electronically (see Mill Run website) or by cash/check. If you do choose to send money to school with your child, please make sure it is in a clearly marked envelope. If you send in a check, please make sure your child’s lunch number is written on the check. Please also note that if your child eats breakfast at school the money needed to buy breakfast will come out of your child's account. 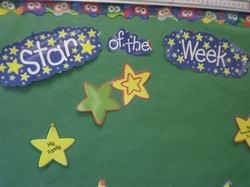 When your child is star of the week, I will interview your child and post his or her responses on our Star wall display. Your child is welcome to bring in a few photos or other small items to add to the display during that week. If you need a reminder as to when your child is scheduled to be the star, please send me an email. I'm happy to get that to you.